1 Preheat oven to 180°C (approximately 350°F). 2 For the cake, measure and prepare all ingredients accurately. Grease the bottom of a springform pan with butter. Mix yolks with half of the sugar and vanilla sugar until fluffy. Beat egg whites until stiff. Sprinkle with remaining sugar and continue beating until glossy and cut resistant. Fold egg whites into egg yolk mixture. Mix flour with cornstarch and sift into egg mixture. Mix and pour batter into prepared springform pan. Smooth and bake for 45-50 minutes. Cake is done when toothpick inserted in center comes out clean. Carefully remove with a thin knife from edge of springform pan. Place on a wire rack and cool for at least 2 hours. Cut twice horizontally. 3 For the filling, peel oranges and separate segments. Squeeze out juice. Boil juice, liqueur and sugar with orange segments for about 4 minutes. Remove from heat and place 10-12 orange pieces aside for garnish. Cool down syrup. 4 Whip heavy cream with stabilizer and fold in cocoa powder. Place half of mixture into a piping bag with a plain nozzle. Pipe a ring around border of bottom cake layer. Fill center with orange syrup. Top with next cake layer and repeat. On top layer, spread remaining cream on cake. 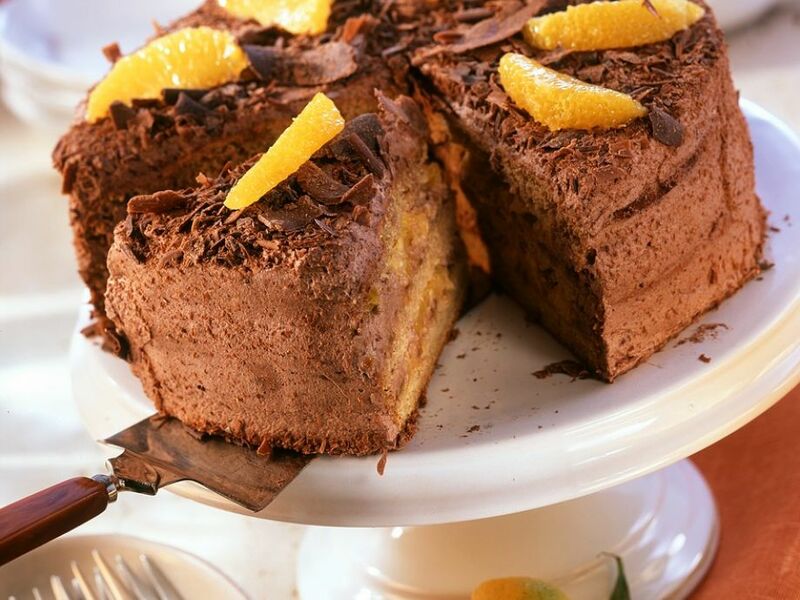 Sprinkle with grated chocolate and garnish with reserved orange segments. Refrigerate until ready to serve.